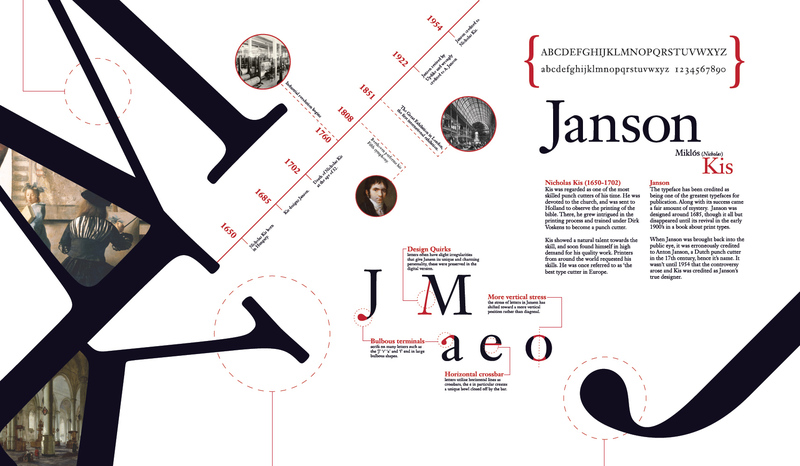 Students produce poster-sized information graphics to explain both the historical development and formal idiosyncrasies of an assigned typeface. Typography is the art of arranging letters on a page, computer screen, in a physical space, or choreographing in space and time, as seen in television or movie credits. The purpose of typography—the clear, straightforward, and unambiguous communication of language—has both technical and aesthetic concerns. This course introduces students to the development of typography from the earliest Phoenician alphabets, to the developments of the printing press, through 20th-century modernism, and includes contemporary thoughts on typography and page design. Basic terminology, type classifications systems, and theories on logical document structure are introduced through readings, class discussions, and assignments. Students are expected to refine their conceptual and practical approach to typography through iterative exercises throughout the term. Projects include the creation of printed posters, booklets, and interactive portfolios emphasizing the challenges inherent in designing for a variety of media at dramatically different sizes and resolutions. For these projects, students are encouraged to choose an appropriate typeface to effectively communicate their message. They are also assigned a typeface and then tasked with determining suitable methods for working with its idiosyncrasies to produce visually appealing, informative, and highly readable documents.